Oberland Station Little Village Optional. If you do not use it, you will have to replace some furniture. 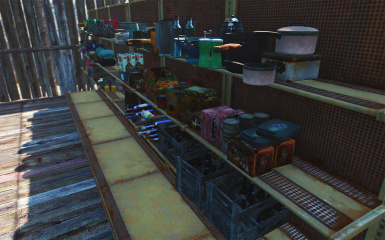 Transfer Settlement - Train Home Blueprint NOT REQUIRED/RECOMMENDED - Great mod for adding clutter on shelves. 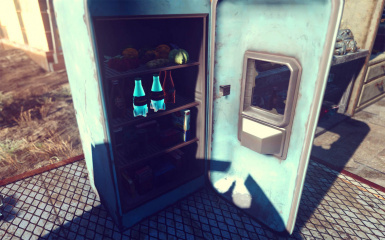 There are some items used around that have this, but you can omit this mod if you like. 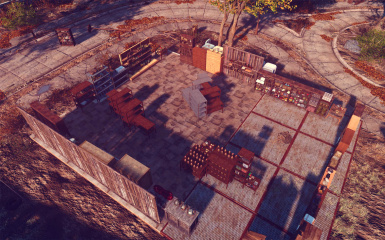 Wasteland Outpost - Abernathy Farm blueprint Include the Extra Ammo option. 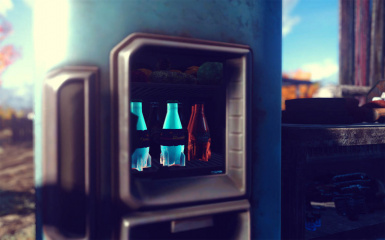 Wasteland Outpost - Tenpines Bluff blueprint Include the Extra Ammo option. 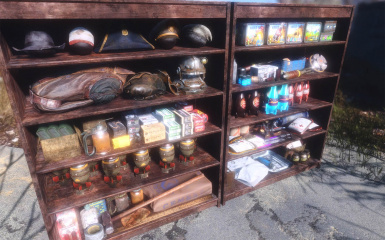 + tons of new clutter - something like 20 new pieces? 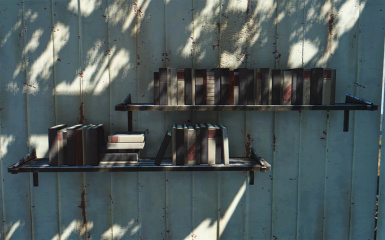 + metal shelves in new sizes - short, narrow, small (the narrower versions will fit the clutter better). 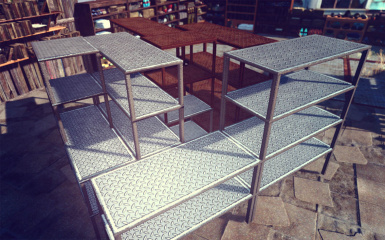 ALSO metal shelves now come in a shiny pre-war metal! It's as if the war never happened. + also added a fixed version of the bureau! 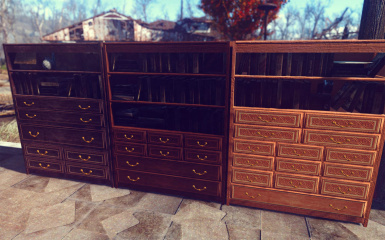 Your settlers will stop leaving drawers half-open. Those lazy bastards. + added a cluttered up bookcase door! 1.3 adds a ton of new stuff - from drawers to working fridge- and bureau doors - plus integration for Dino's Decorations, which now has its own menu within the DIY menu (provided you have both mods installed)! 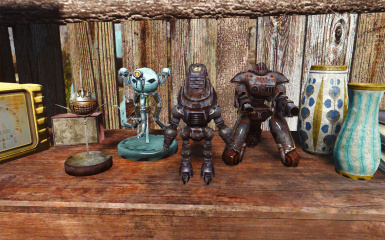 + a few institute themed clutter, a raider themed clutter and a few more assorted things + an institute wall shelf. + 3 new shelves: two garage cabinet (including the wall one) and a larger wall shelf. 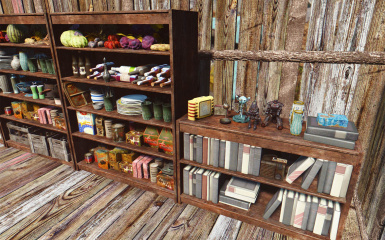 + 2 new, clean retextures of the wooden shelves, including the wall shelves. 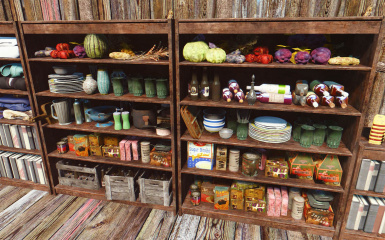 + new clutter that only takes up half a shelf, and can be placed next to other half-shelf clutters. 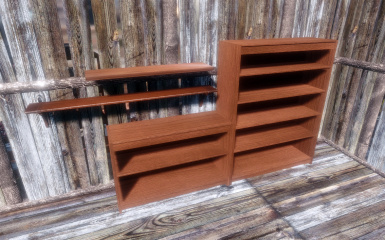 + workshop menu now added by script to the furniture category, in order to avoid compatability issues and category bloat (there's now sub-categories!). 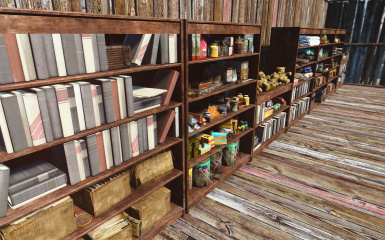 The aim of this mod is to offer an easy way to fill up those empty bookshelves and make a settlement look a little more lived in. 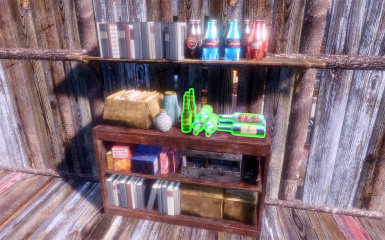 I've been brainstorming ideas on how to make shelves a little less empty in my settlements, but without the work of placing every item individually every time. 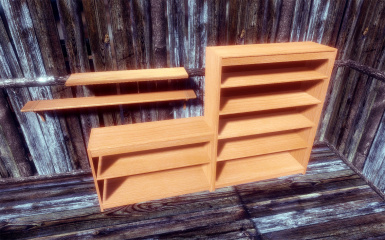 What I've come up with is this: shelves with snap nodes, and pre-made clutter in shelf size with snap nodes. 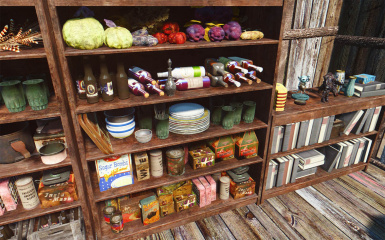 Place a shelf, snap clutter in. + sorting the menu a little more - it's getting a little cramped! Sorting shelves either by material (wood/steel) or texture (pre-war/post-war). Sorting clutter by I don't know. Thinking about that one still! NOTE: To make the snapping work, you'll need to first place the custom shelves - named "DIY 01 yourShelf", "DIY 02 yourShelf" and so on. 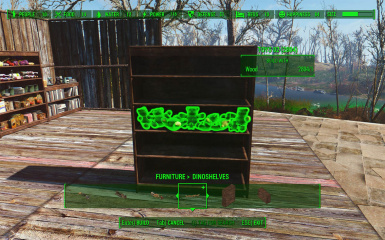 In the same category, there is pre-made clutter in shelf size, which will snap into the dinoShelves. 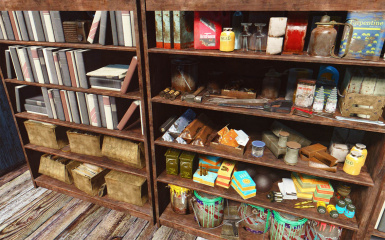 Clutter may be placeable on certain vanilla shelves but they won't snap. 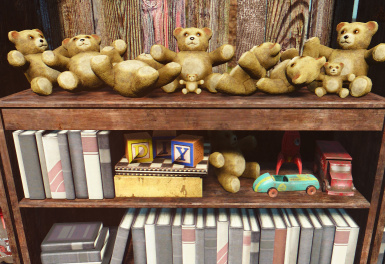 If the clutter is a little difficult to snap into place, try moving backwards and make sure you're looking directly at the shelf - if that doesn't work, move the shelf a little bit away from the wall, and try again. All items are added via script in their own category under furniture -> do it yourshelf. 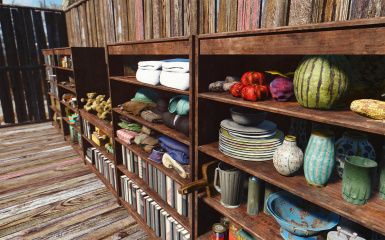 Put down a bookcase/shelf first and add the clutter by snapping it in - like you'd do with doors into doorways. 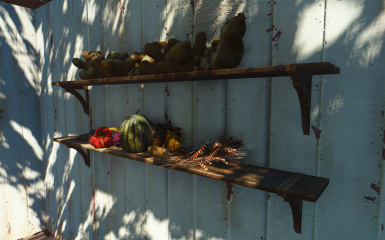 For minimum hassle, put the bookcase/wall shelf in its intended place before adding clutter. + All free standing shelves snap together, but must be held fairly close together in order to snap. 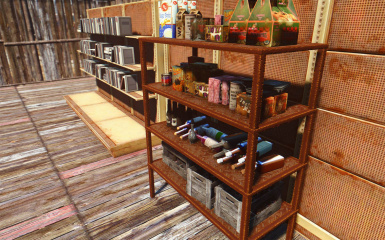 Craft the chem "Uninstall Do It Yourshelf" with the chem station - it's under utility. Use it first, save your game, then uninstall to make sure you retain the "Furniture" category. If you lost your furniture menu, see the furniture fix file under misc files. If you have any other problems check to see if they're covered in the FAQ in the comments section. If you're using cartman1975's full cost ammo clutter, remember to scrap that first, or you lose the ammo you've used to build it with. 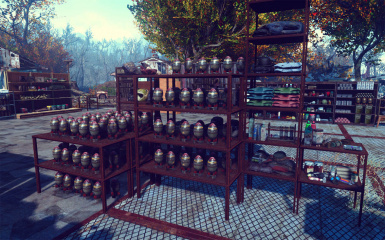 + I tried to be reasonable with crafting costs, so some of the things may be a case of 4 tatos for the price of 1 etc. + Clutter snaps to walls, which is a side effect, really, but may come in handy? Should be compatible with pretty much anything as it adds its menu by script. 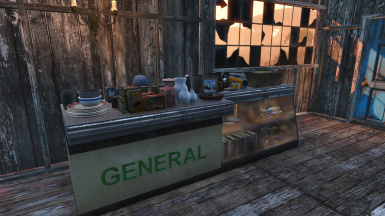 The FO4 patch v1.4.1 adds new trading counters and this mods contains meshes with snap points that overwrite those. Next version will have non-overwrite versions. While this can work fine as a standalone, I recommend it with Place Everywhere for even more freedom to put random things in and on your shelves and OCDecorator for even more stuff to put there! 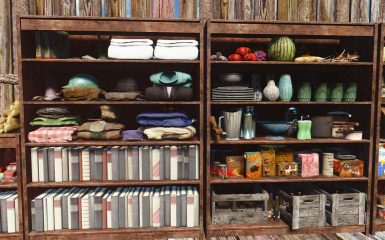 You can never have too much clutter. + Made thanks to the Outfit Studio crew, Elianora's youtube guide to static item mash-ups, the Nifskope team, Bethesda's Creation Kit, Val whom I've been hounding to test it for me, and an unreal amount of patience. Also, damanding is a goddess.